Bernie Sanders was the sole contender for the presidency who attended the White House Correspondents' Dinner this year, and the photographic evidence of this occurrence constitutes some of the most adorable photos of politicos I've seen in awhile. These photos of Bernie from the White House Correspondents' Dinner will make you mad jealous you weren't there to snag a selfie or two yourself! 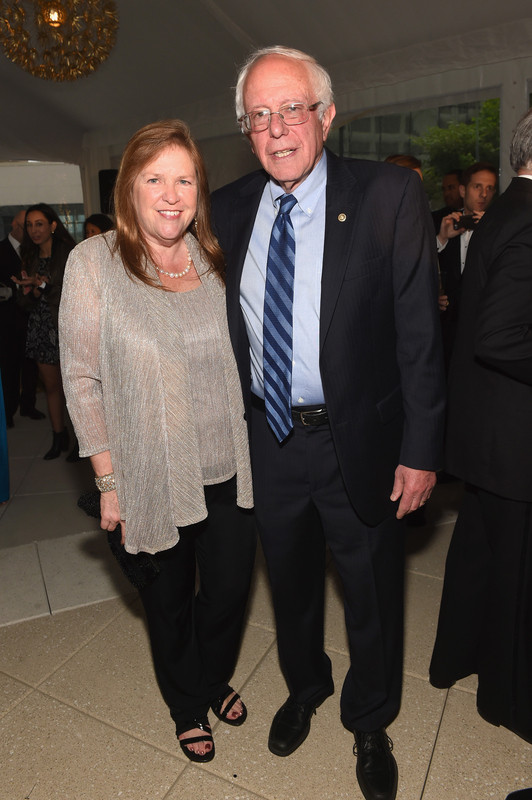 While Dr. Jane Sanders wore a neutral-shade metallic dress and matching jacket, almost like a more minimalist version of Michelle Obama's breathtakingly intricate beaded gown, Senator Sanders caused a minor kerfuffle on social media when he showed up for the event of the Washington D.C. social season in... wait for it... a suit and tie. Cue the collective hand-wringing over official decorum! While a sartorial faux pas such as this surely doesn't even begin to approach the frequency, or severity, of the gaffes made by other candidates, such as the one who's last name rhymes with "dump," it does seem a bit unfair to harp on one of the least financially well-off members of Congress for failing to have a tuxedo just lying around. It seems a bit Trumpian, to be perfectly honest, to be so obsessed with outward appearances, no? The man doesn't own a tuxedo. So what? Looking perfectly presentable in a suit jacket, light blue button-down and tie, the independent-minded senator from Vermont clearly had no problem finding people to talk with, or to take photographs with. After all, one of the hallmarks of the feminist movement has been to take a stand against overly gendered forms of dress. Like, the right to wear pants in public and not be seen as some kind of kooky cross-dressing harlot, for example. While this isn't exactly the same thing, the whole to-do over Bernie's wardrobe choice just seems more Mean Girls than anything else. Eschewing a tux in favor of slightly less formal attire, even at such a high-profile event, is actually a bit of a genius political move when you think about it. For one thing, it's keeping in line with the grassroots, homespun, anti-establishment ethos that his movement is all about. It also achieved the relatively rare feat of getting the chattering classes to shame a man for his attire, instead of picking a woman to throw shade at. I don't know if that's exactly the future I want to believe in, but it might be a start.